Reminder for Wednesday- Juniors-Breakfast will be served in the home ec room starting at 7:45am. 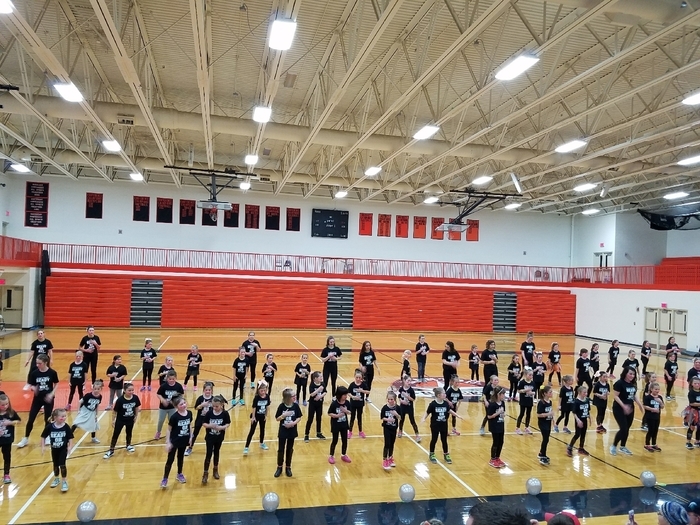 Testing will begin in the gym at promptly 8:30! Good evening! This is a reminder that 9th, 10th, and 11th grade students will be testing Tuesday morning. 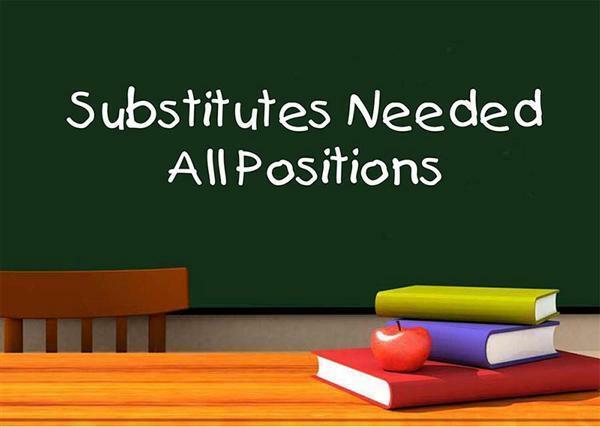 Please make every effort to have your students in school, and on time. Also, 11th graders will be testing Wednesday morning as well. Due to the possibility of ice in the morning, but warm afternoon temperatures, a delay may be called tomorrow. We will make a decision in the morning if a delay is warranted. Manton Consolidated Schools will not have school on April 19th. Our current projected last day of school is June 14th. 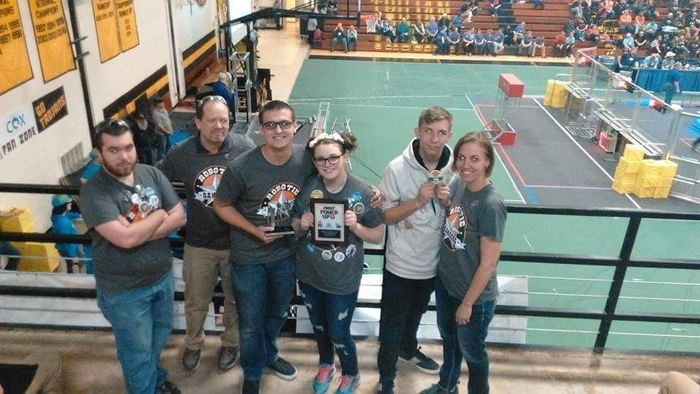 For more information, please see the letter dated April 3 on our school website, www.mantonschools.org, under the news section or go to our school app. Due to the icy conditions of our secondary roads, Manton Consolidated Schools will be closed today, Thursday March 14th. 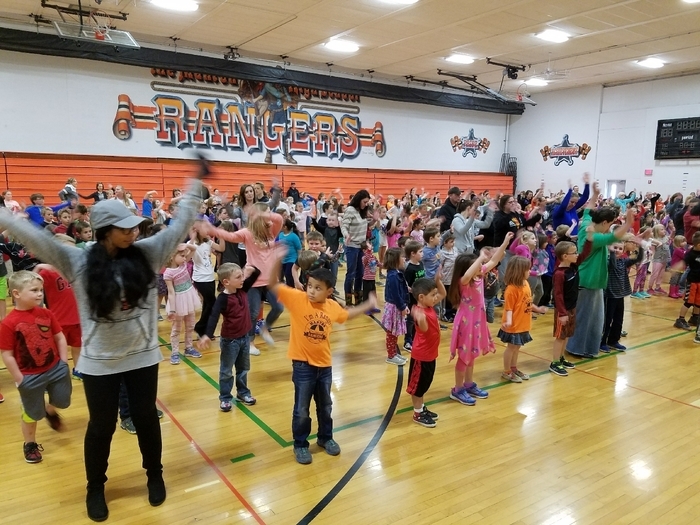 Manton Elementary's Mileage Club Assembly! 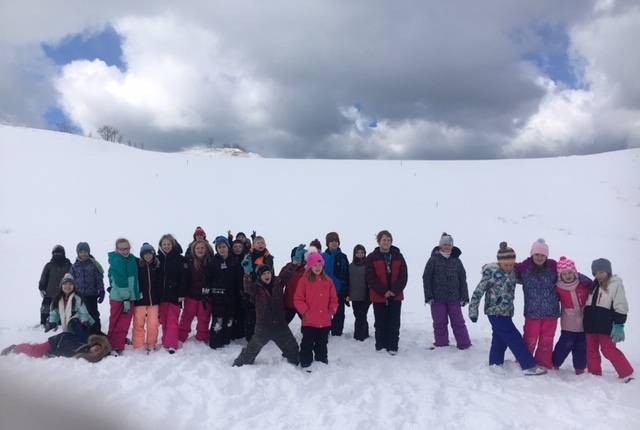 Our 4th graders went snowshoeing at Sleeping Bear Dunes yesterday! Boys regional basketball tickets will go on sale tomorrow Monday Mar. 4th at noon in the high school office, for the game Tuesday night at 6:00pm in Houghton Lake. Due to weather and road conditions, Manton Consolidated Schools will be closed tomorrow, Monday, February 25th. 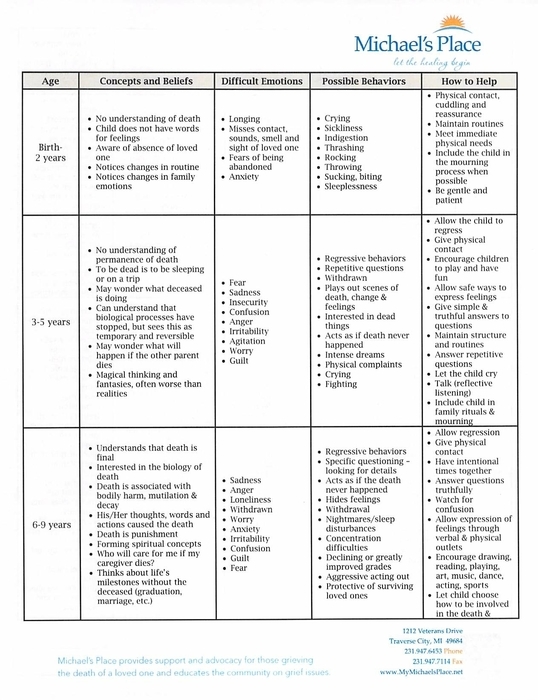 There is an updated Pesticide Use Advisory letter on our website. Go to MCS main page, click Menu - Documents - Pesticide Information. Please refer to the letter if you have any questions. Thank you! Kindergarten celebrating the 100th day with a 100th day fashion show! 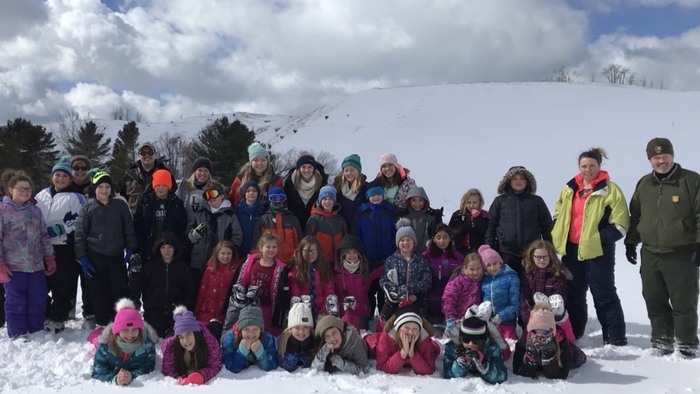 Please read the February 13, 2019 Snow Day Update Letter located under the News Section of the Manton App or Manton Website for important information regarding snow days. Due to the number of snow days we have had, tomorrow's 1/2 of school is now a full day for students. We are cancelling parent-teacher conferences for the afternoon, but the evening conferences are still on. We are working on ways to make up those cancelled conferences. Due to the drifted road conditions, Manton Consolidated Schools is closed today. Due to the impending storm and expected travel conditions throughout the day, Manton Consolidated Schools will be closed today, Tuesday, February 12. Due to icy road conditions, Manton Consolidated Schools will be closed tomorrow, Friday, February 8th. Due to expected ice accumulation and travel concerns expected during the school day, Manton Consolidated Schools will be closed today, Thursday, February 7. Due to icy secondary roads, Manton Consolidated Schools will be closed today, Monday, February 4th. Please see the article about the provided lunch opportunity tomorrow under the news section of our app or website. Due to the extreme wind chill predicted for the entire day tomorrow and road conditions, Manton Consolidated Schools will be closed tomorrow, Thursday, January 31st. The NHS Blood drive is rescheduled for Friday. Due to the extreme wind chill predicted for the entire day tomorrow, Manton Consolidated Schools will be closed tomorrow, Wednesday, January 30th. Due to the road and weather conditions, Manton Consolidated Schools will be closed tomorrow, Tuesday, January 29th. Please stay safe and warm! 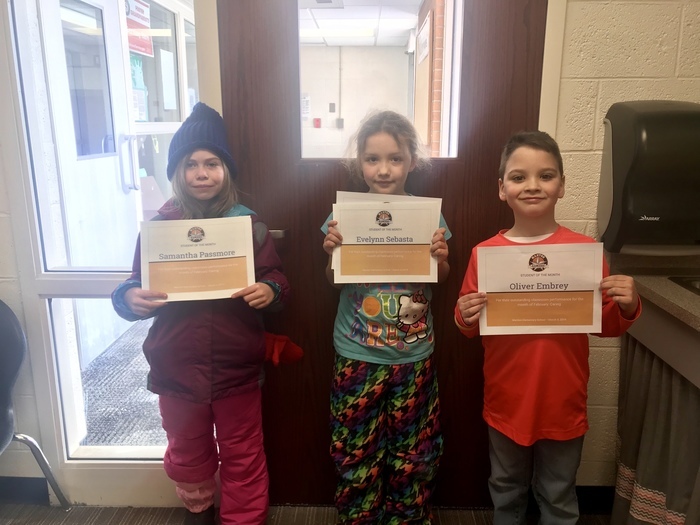 Please read the January 28th Snow Letter located under the News Section of the Manton App or Manton Website for important information regarding snow days. A decision on school tomorrow has not yet been made. Due to the incoming storm and dangerous travel conditions predicted for tomorrow morning and throughout the day, Manton Consolidated Schools will be closed tomorrow, Monday, January 28. Please stay safe! Manton Consolidated Schools will be closed today, Monday, January 21, due to wind chill and buses not being able to start. Manton Consolidated Schools will be closed today, Thursday, January 17, due to the icy secondary roads. Due to the icy road conditions Manton Consolidated Schools will be closed today, Wednesday, January 16. Manton Consolidated Schools will be closed tomorrow Tuesday, January 8, due to icy back roads. High school exams will be Thursday, Friday, and Monday. 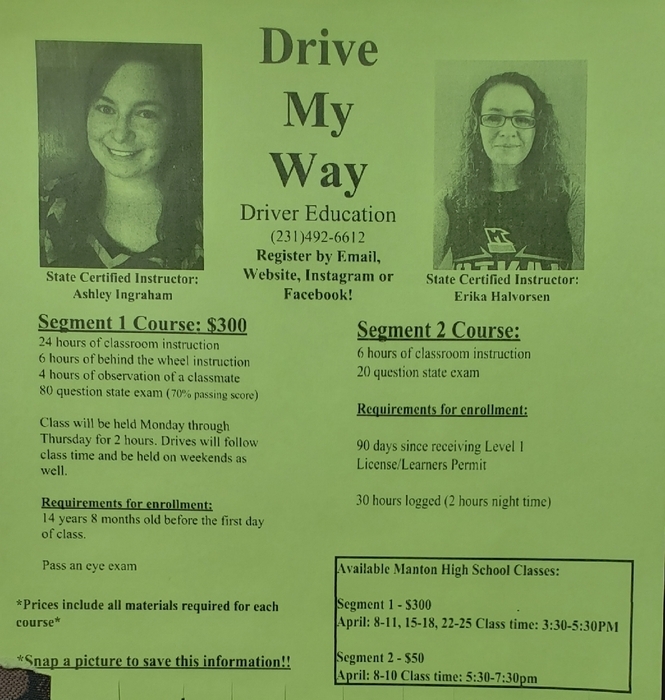 See the Manton High School Facebook page for more details. Manton Consolidated Schools will be closed today, Monday, January 7 due to current and expected road and weather conditions. 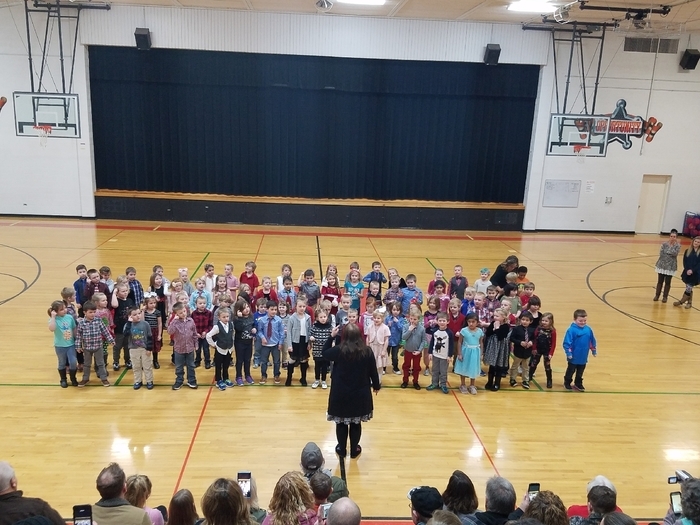 Kindergarten Christmas Concert sing Santa Claus is Coming to Town. 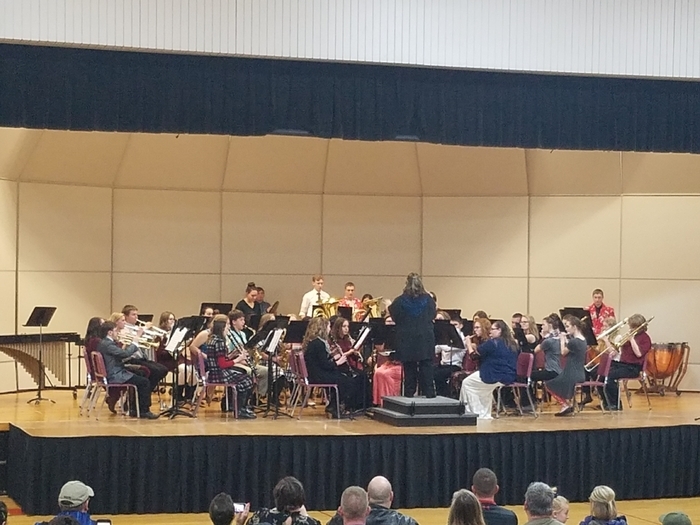 Manton High School Band at tonight's concert! 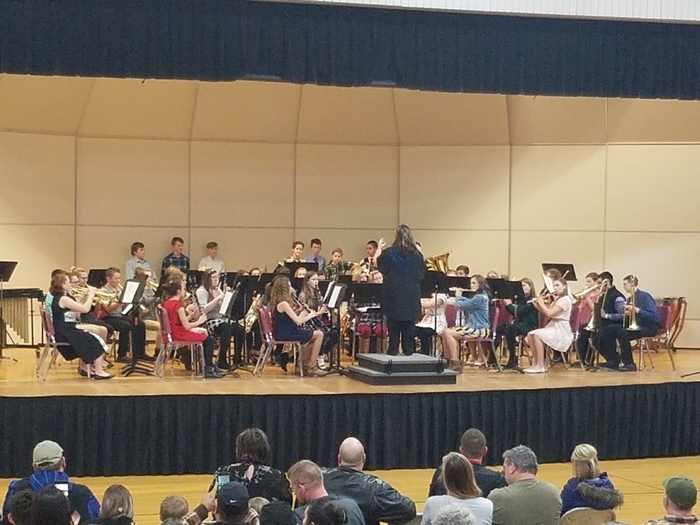 Middle school performing at the winter concert. 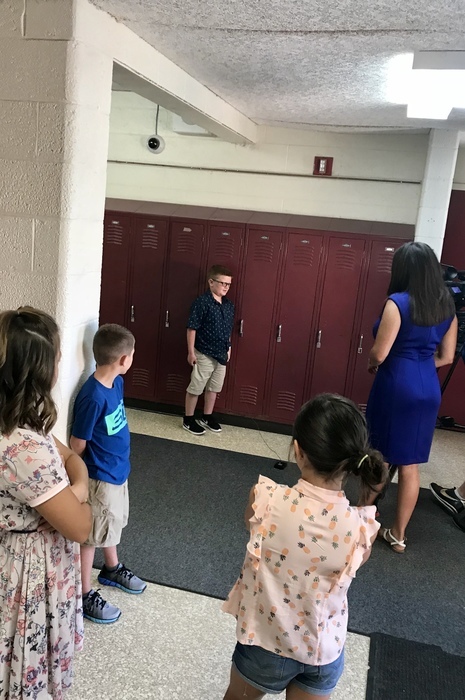 This message is to inform you that a case of Scabies has been identified at Manton Elementary and Manton Middle School and your child may have been exposed. Scabies mites may be transmitted through skin to skin contact or sharing clothing. Please see our website for more info. Congratulations to Jake Renfer on his 100th career wrestling win! Manton Elementary will be having a food drive on Monday, December 10 and will end on Friday, December 14. Thank you! Manton Consolidated Schools will be closed today, Monday December 3rd, due to icy road conditions on our back roads. Thank you for all of your donations for our PTO Jump-a-Thon! 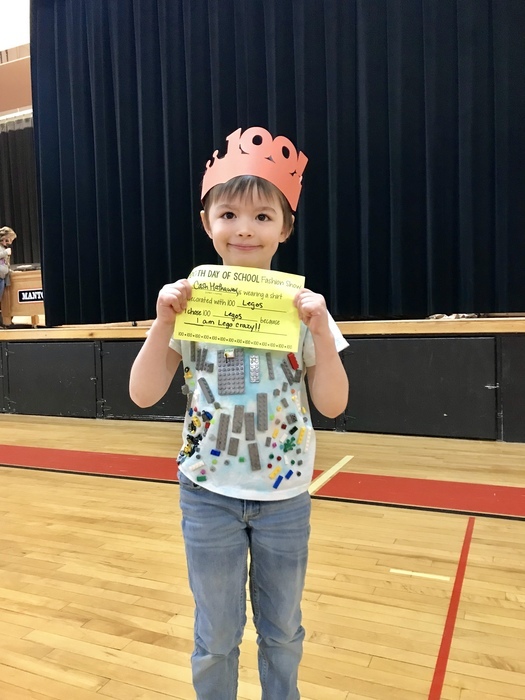 The prize assembly was a huge success! A quick reminder that next week we have a full day of school on Monday and Tuesday. No school on Wednesday. This is a change from the schedule sent out before the school year started. 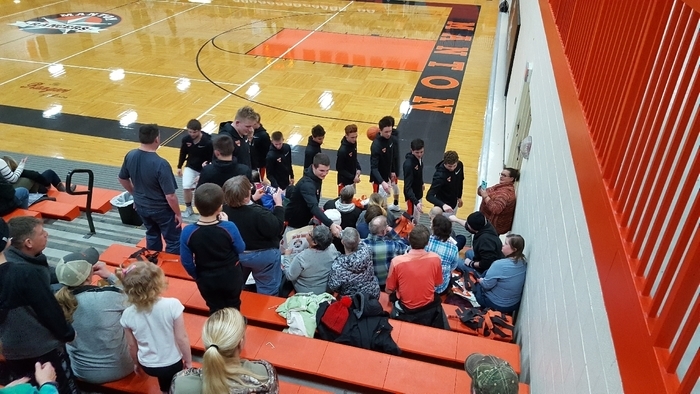 Good luck to our Lady Rangers as we send them off to Houghton Lake to take on Beaverton! Game time 6pm! Just a quick reminder of a couple of things. 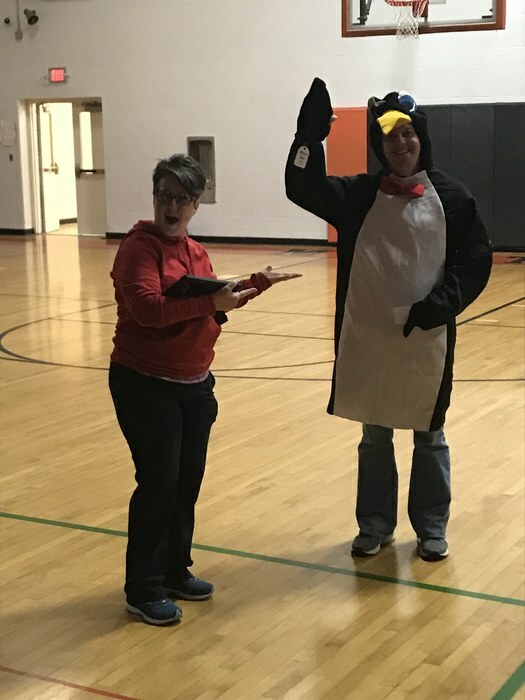 Today's Elementary Halloween Parade is at 9:30 inside the school and the 5th Street Gym is open for parents. Today is 1/2 day of school. There is school tomorrow, but there is no school on Friday. Also a friendly reminder of the band taco dinner fundraiser is tomorrow from 5-7 PM in the Multipurpose Room. Just a reminder that next week we have a half day of school on Wednesday the 31st of October and no school on Friday November 2nd. 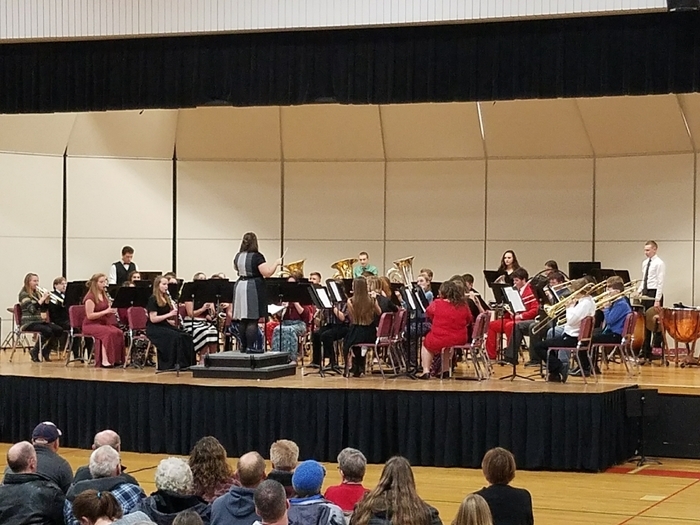 The band is also sponsoring a Taco Dinner in the MPR on Thursday November 1st from 5-7 PM to raise funds for their band trip in March. Pre-ordered "Fight Like a Ranger" shirts are now available for pick up in the high school office. 6:30 tonight at the JV Football Game! Lots of activities! Come out and support Kira! Due to a down power line obstructing US 131, the buses are unable to pick up any student south of 22 road. We apologize for any inconvenience. 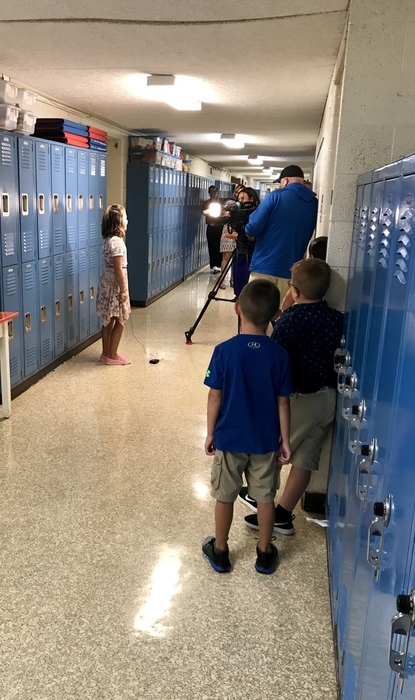 Manton Elementary Students Having Fun with the News! Thank you class of 2018 for the donation of our new school sign! Thank you Eric Peterson for creating it! Unfortunately the flyer did not attach. 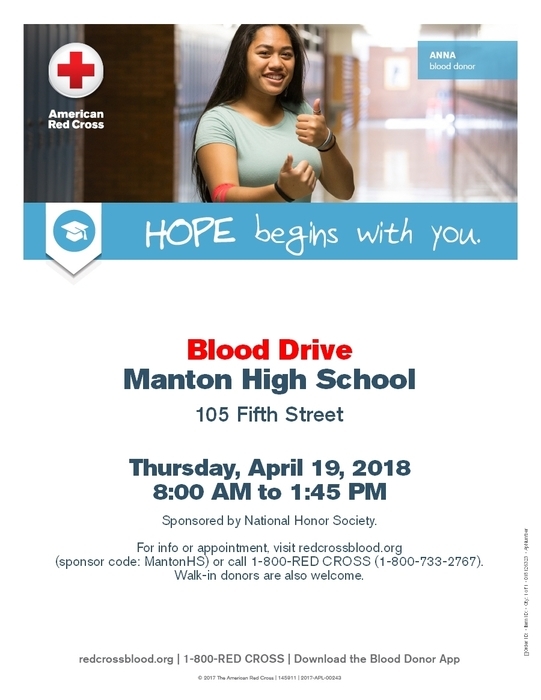 Please call 1-800-443-2297 to schedule an appointment or see the flyer on our website at www.mantonschools.org under the Livefeed section. 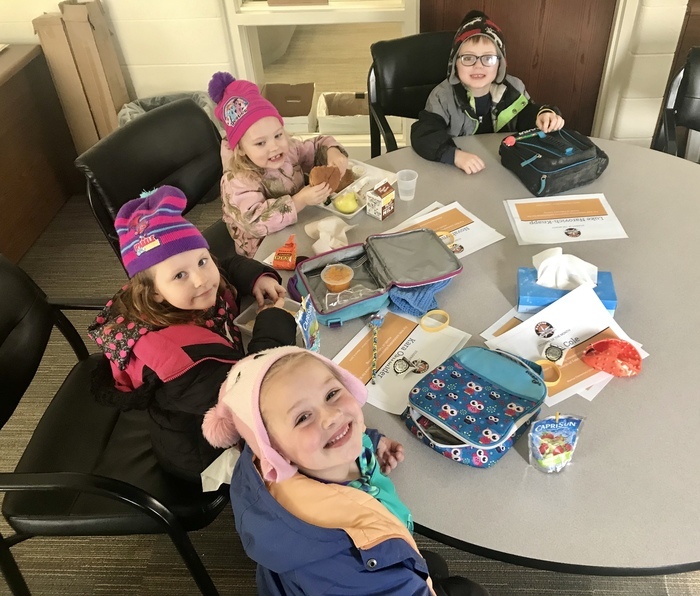 Manton is still recruiting for the Head Start and GSRP Preschool Program. Please see the attached flyer for details and contact information. 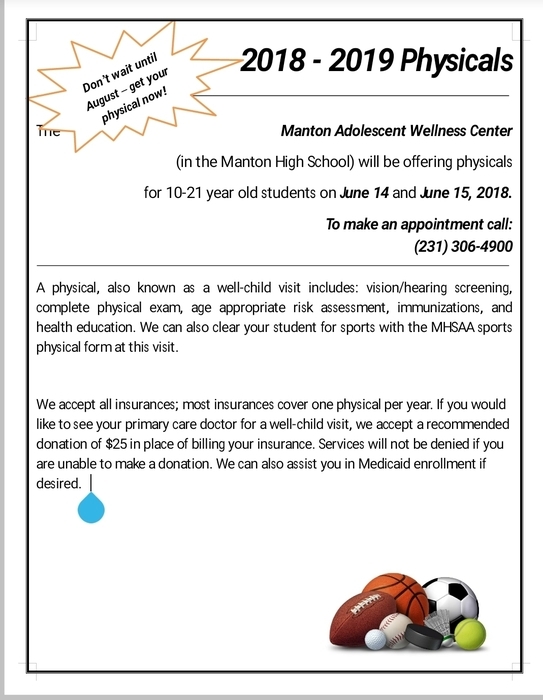 Sports physical appointments are still available this Thursday 6/14 and Friday 6/15 at the Manton Adolescent Wellness Center. Please call 231-306-4900 for more information and an appointment. 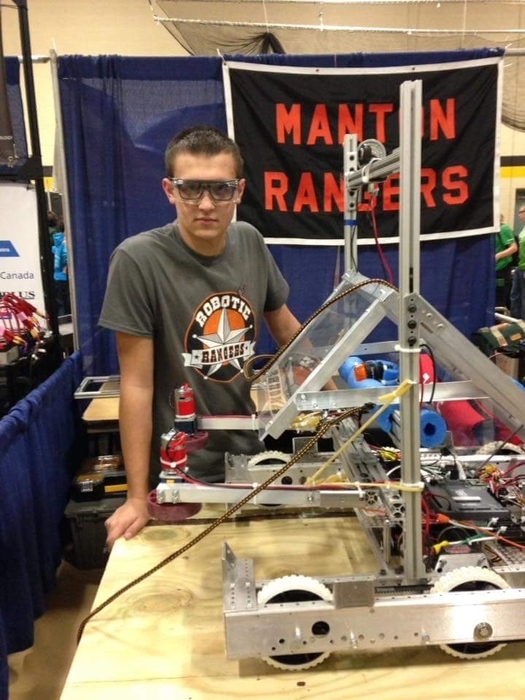 The Manton School Board Meeting for this evening has been cancelled due to scheduling conflicts. All agenda items will be moved to the June 20th board meeting. Thank you! Starting Monday June 11th, we will offer free lunch in the Ranger Room Cafeteria to all children 18 and under. Meals will be served Monday - Friday from 11:30-12:30. Just a reminder that this Friday, June 1st is a full day of school. This is a change from the original calendar and was changed due to the snow day make-ups next week. Next Tuesday, June 5th, is the last day of school and is a half day. 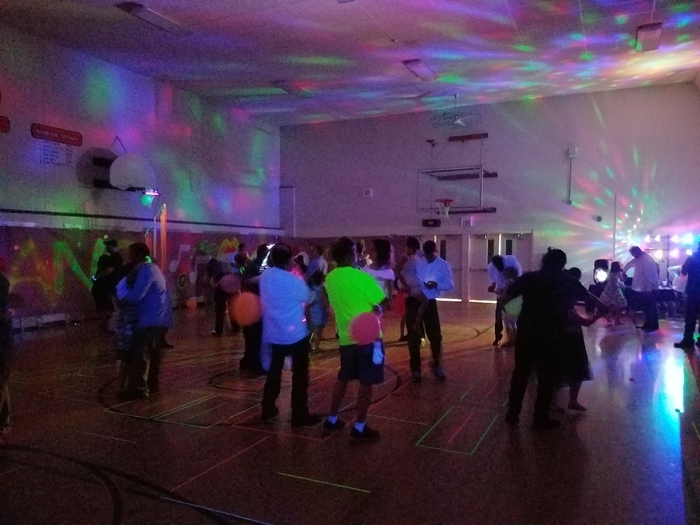 ACES taking place in the 5th Street gym! Our additional snow day waiver has been approved by the Michigan Department of Education. Our official last day of school is currently Tuesday, June 5th. That Tuesday will be a 1/2 day. Due to road conditions Manton Consolidated Schools will be closed today Tuesday, April 17th. Due to road and weather conditions, Manton Consolidated Schools will be closed Monday, April 16, 2018. 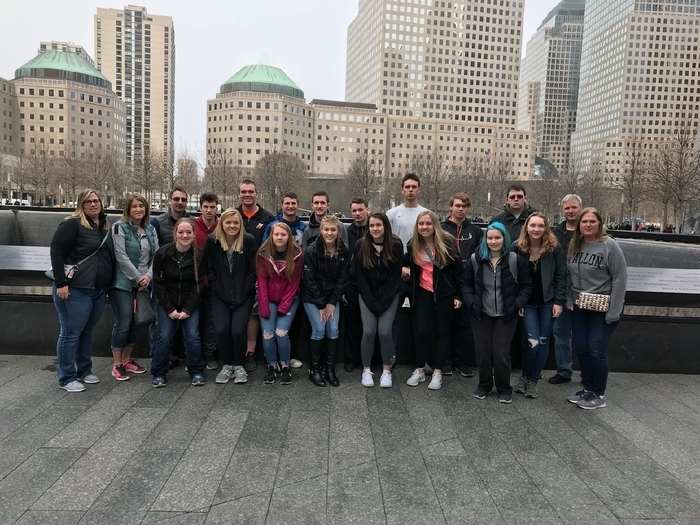 Senior class at the 9/11 Memorial! 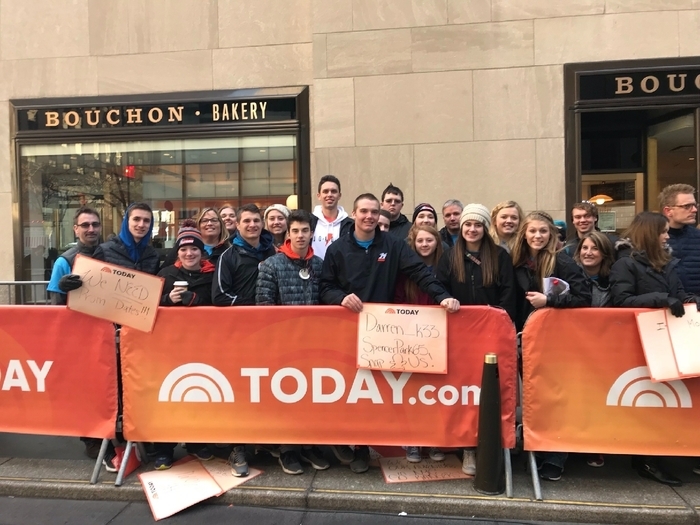 2018 senior class live at The Today Show! Due to road conditions and poor visibility Manton schools will be closed today Wednesday, April 4th, 2018. 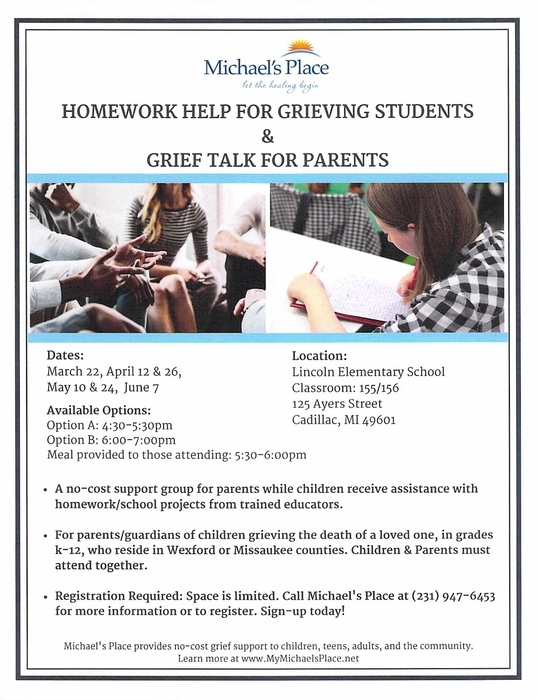 Michael’s Place Grief Support Center out of Traverse City, will be here on Monday, March 19, 2018 beginning at 10:30 in the morning to conduct “debriefing” sessions with our 7th - 12th grade students so that these students have an opportunity to talk about how everyone is holding up, hear what others are feeling, and take the time to just be together. This will be a voluntary activity for the students and students from other grades MAY participate if they choose to. 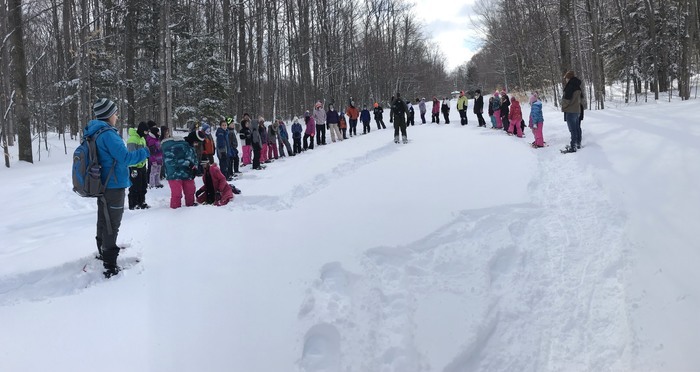 If you wish to have your student NOT participate in this activity next Monday, please phone the appropriate school office and opt the student OUT of the debriefing session. Please again take note that this will be completely VOLUNTARY, and no students will be forced to participate in any debriefing sessions if they choose not to attend. 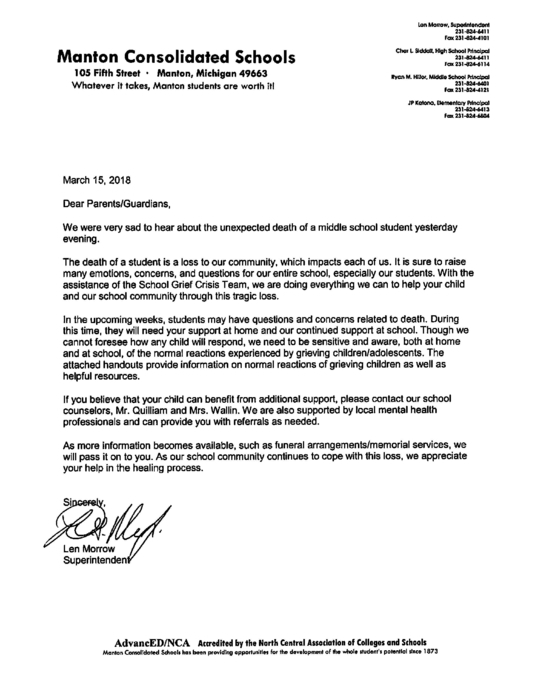 This is an important message from Manton Consolidated Schools: Attached is digital copy of a letter that went home with each middle school student today regarding yesterday's tragedy. 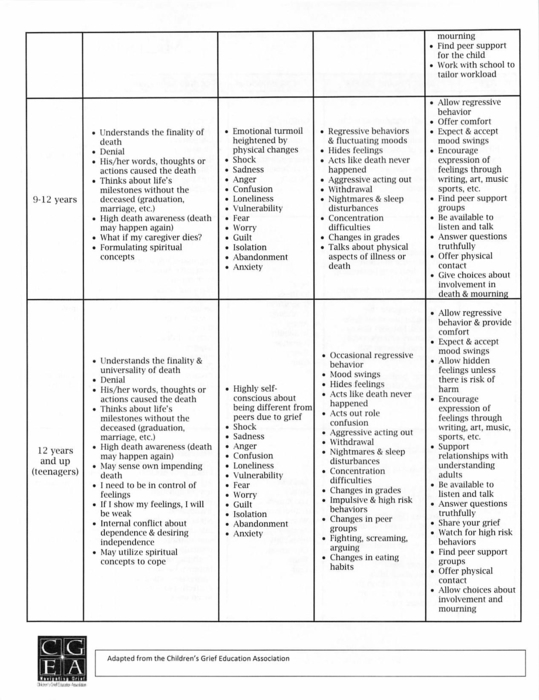 In addition, we included grief information and resources you may find helpful in supporting your child. We will continue to do all we can to support them at school as our community grieves and counselors will remain on site. 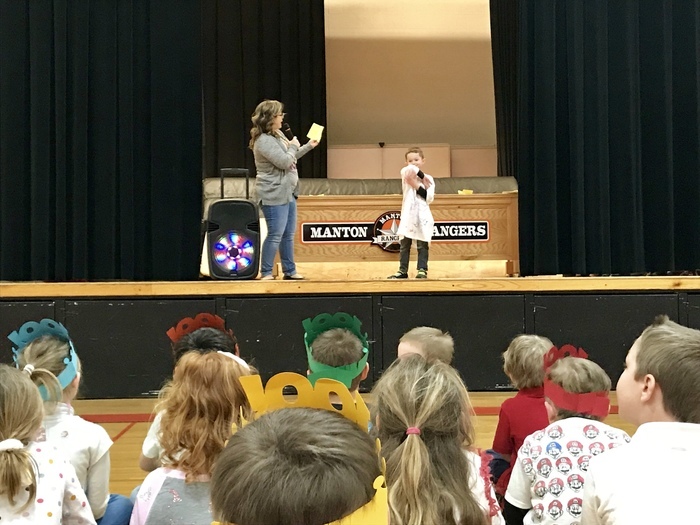 This is an important message from Manton Consolidated Schools. It has come to our attention that there are some concerns regarding the walkout protest which included roughly 20 students today. 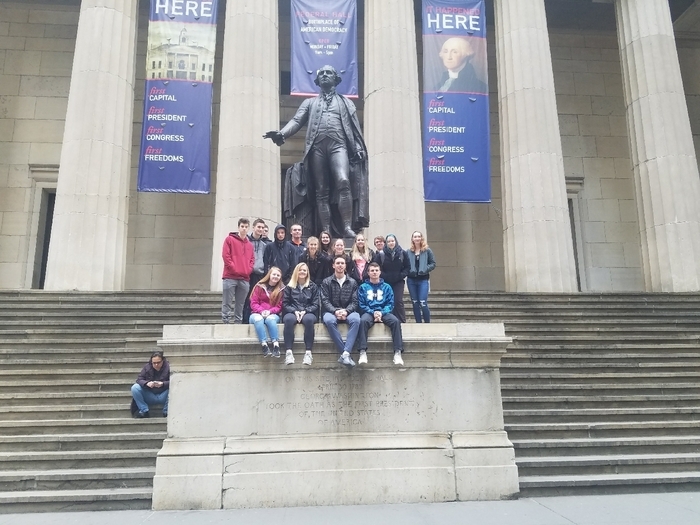 The school was not aware ahead of time that students had plans on protesting today. 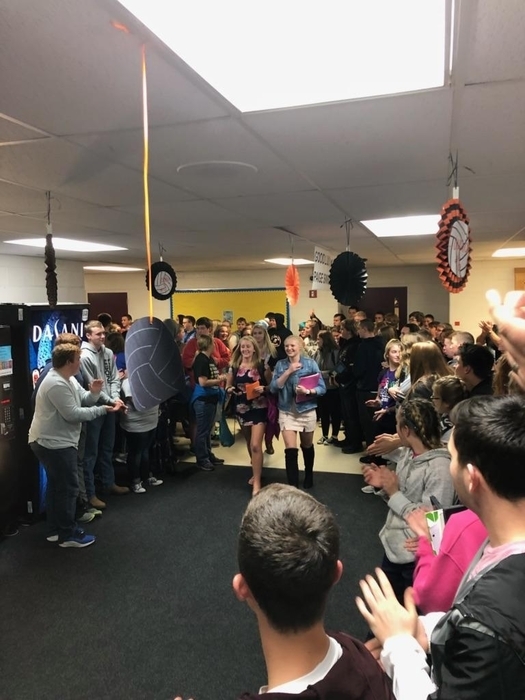 We have had students come and talk with the administration about participating in a protest on April 20th, not today. 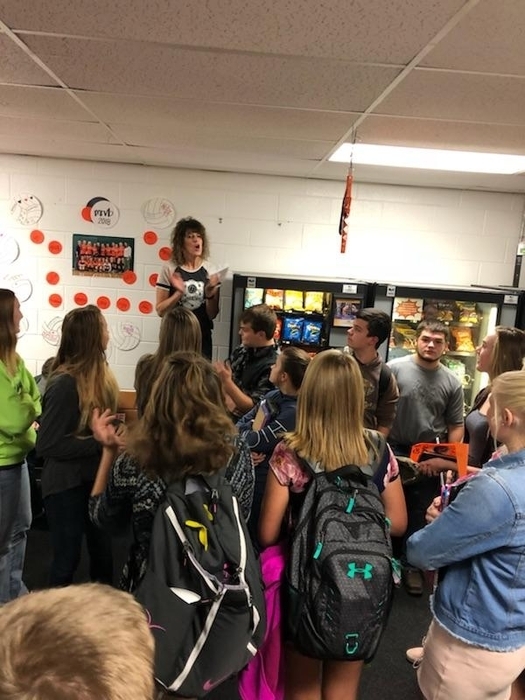 While the school does not encourage such activities, we respect that students do have rights to express their opinions in a peaceful and appropriate manner. 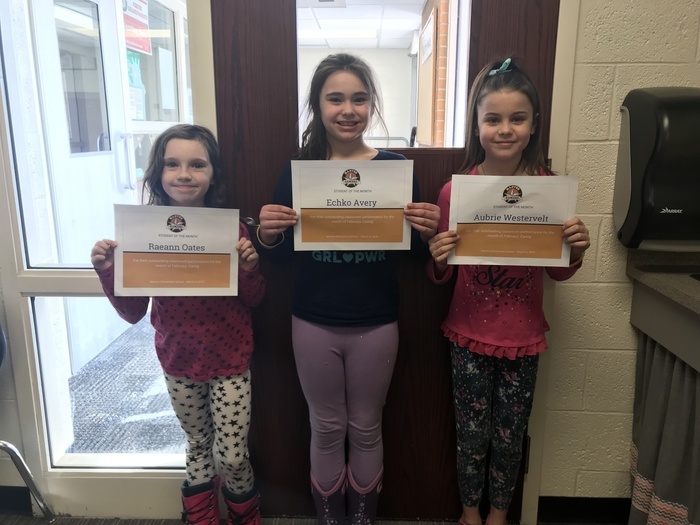 The students who participated today were supervised to ensure their safety. 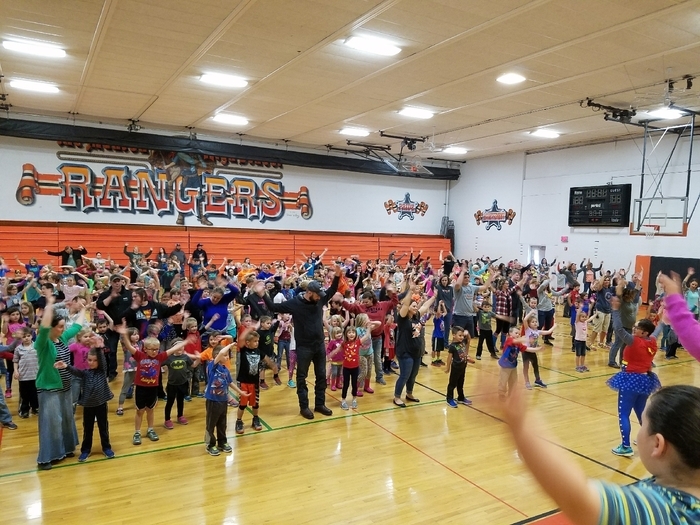 Manton Consolidated Schools conducted a lock down drill at approximately 2pm today as part of our state mandated drill schedule. 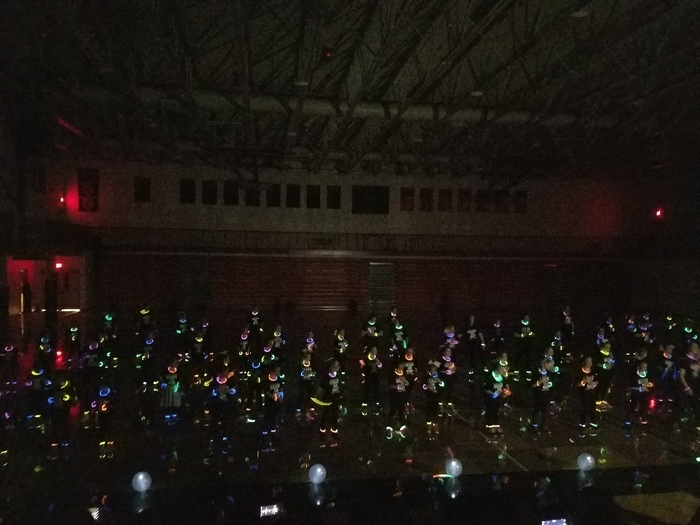 Students and staff did an outstanding job! There will be a paper sign up for summer baseball/softball on Tuesday, March 20th from 5:30-7:30 in the hallway between the 5th street gym and multipurpose room. Thank you! 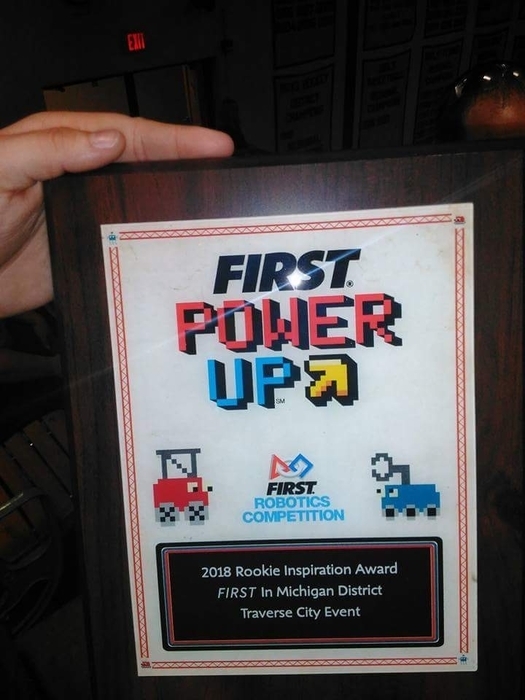 The Robotic Rangers won the Rookie Achievement Award.. AMAZING JOB Rangers! 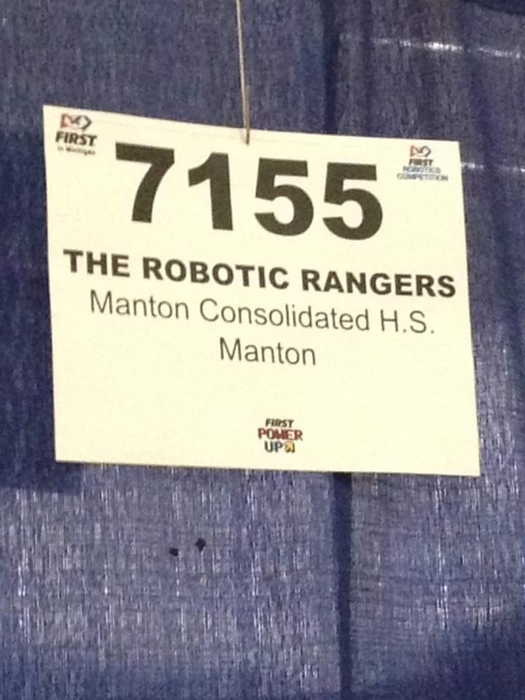 The Manton High School Robotics team finshed 18th out of 40 teams after the 1st round of competition! 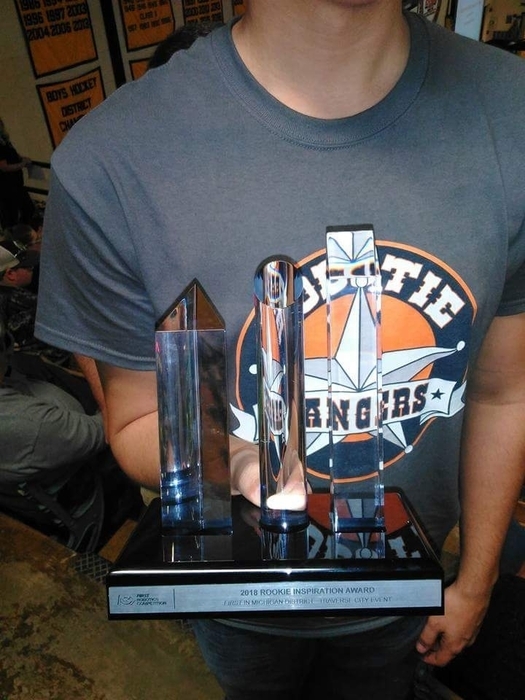 Nice job Rangers! 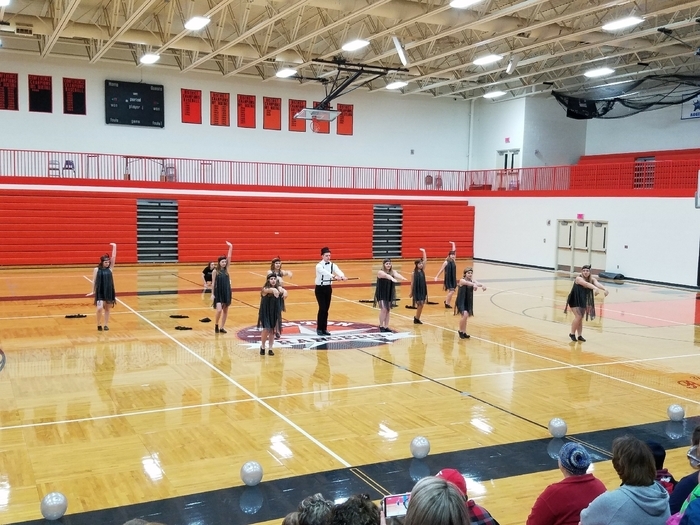 Awesome job for our 1st year program! 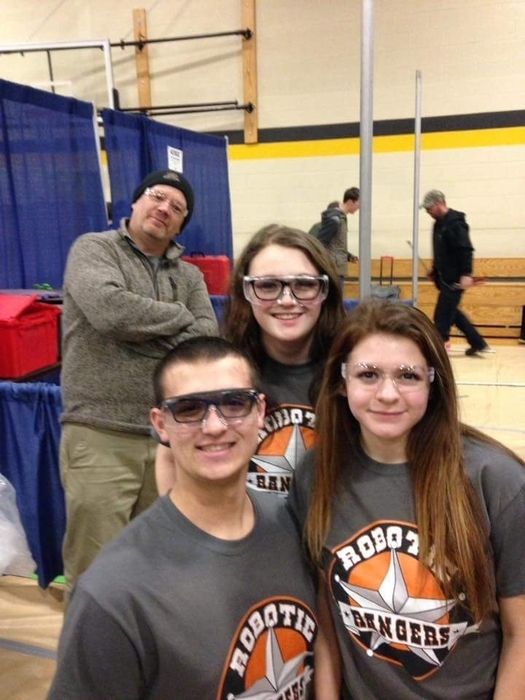 Manton High School Robotics team in action today at Traverse City Central High School! 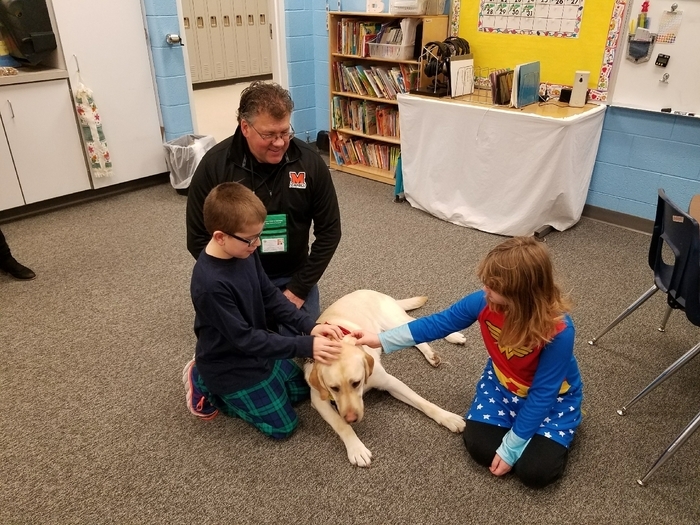 Manton Consolidated Schools would like you to know that we went into secure mode this morning so that we could have trained drug dogs from local law enforcement agencies do a sweep of our school. 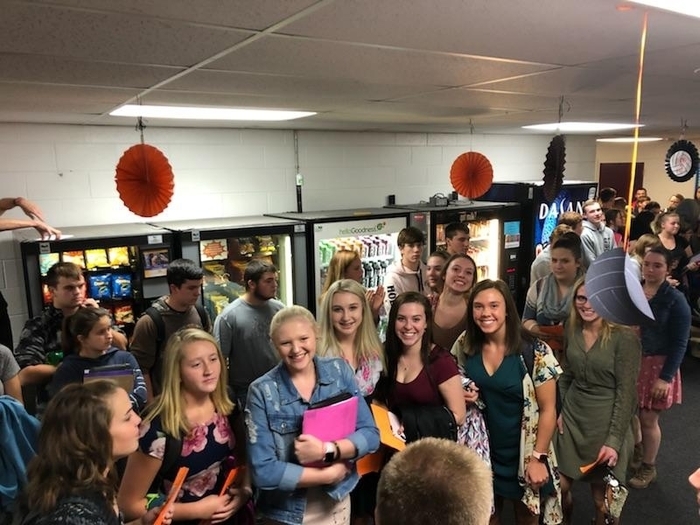 Our number one priority is the safety of all of our students and this is one way to help ensure that. Thank you! 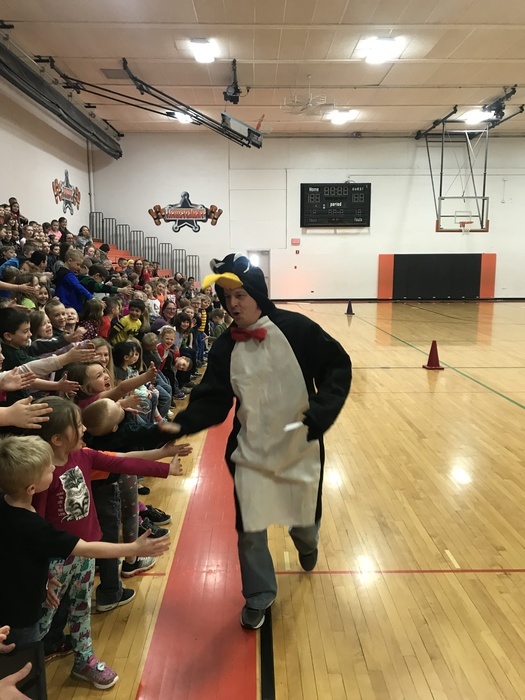 This is an important message from Manton Consolidated Schools. We have again analyzed our absentee rate today. Our percentages were better in the morning, but fell again in the afternoon. In light of the situation, Manton Consolidated Schools will be closed Friday, February 2nd, to allow for the weekend to hopefully break the cycle of sickness we are experiencing. Activities for tonight will go on as planned. The games for tomorrow night have been cancelled. The local health department has provided us a link for additional information regarding the flu. 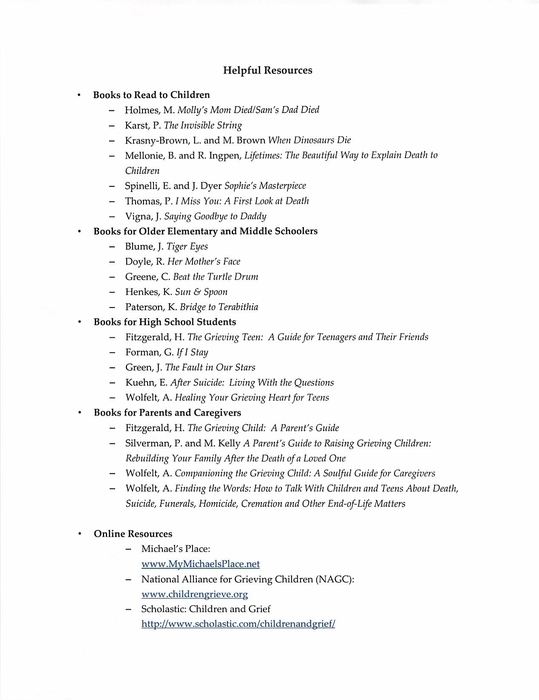 Please see https://www.cdc.gov/flu/resource-center/freeresources/print/print-schools-childcare.htm for details. This is Len Morrow with an important message from Manton Consolidated Schools. Yesterday we heard of a number of students who had been diagnosed with influenza. Today we were able to look at our absentee rates and consulted with the health department and a pediatrician. Based on all of this information, we have made the decision to close school for the next two days, Tuesday the 30th and Wednesday the 31st. School will be dismissed today at its regular time. We will not have practices, or games for today, Tuesday, or Wednesday. Information regarding rescheduling of athletic events will be provided as soon as possible. Latchkey will run during its regular time today. We recommend keeping socialization to a minimum during this time. 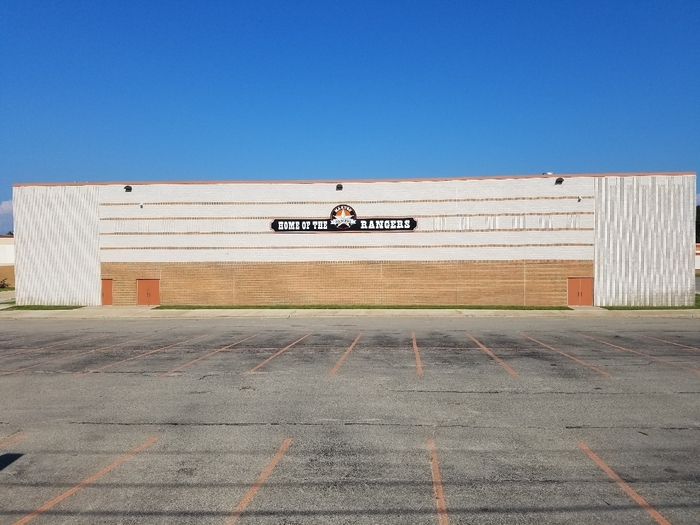 There will be no community access to the buildings or gyms during these days. Closing school is never taken lightly, but with the information we now have we feel it is the best one for our students. Thank you for your time. 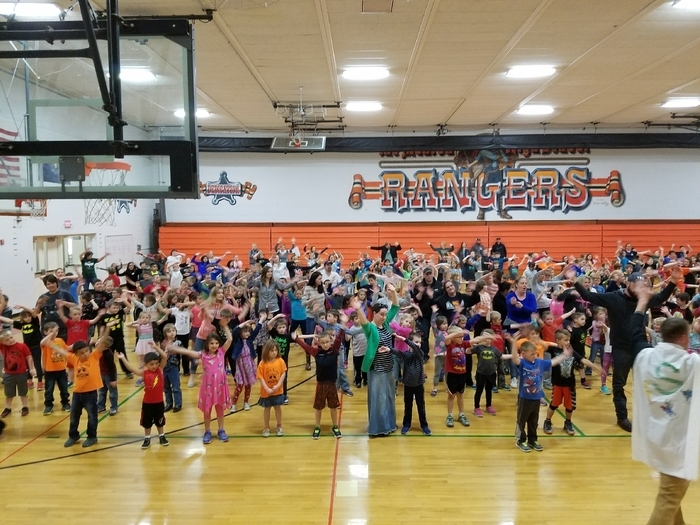 This is an important message from Manton Consolidated Schools: It has been brought to my attention today that several students that attended Camp Rotary have been diagnosed with influenza. Please keep a watchful eye on your child for any flu like symptoms, including a cough/fever and take appropriate precautions. It is flu season and all parents, regardless of grade level, should stay vigilant in recognizing flu symptoms and seeking medical attention if necessary! The school will continue to monitor the situation, thank you. 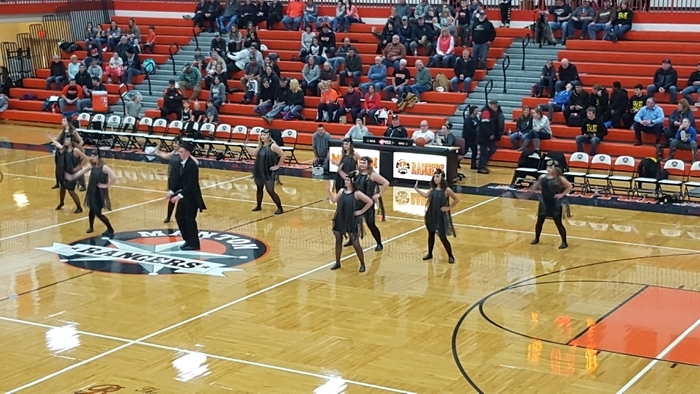 Manton High School dance team. 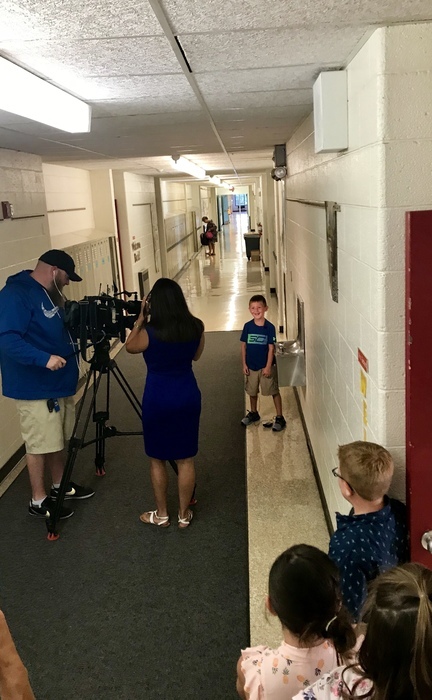 Indy visiting his first classroom in his new role at school! 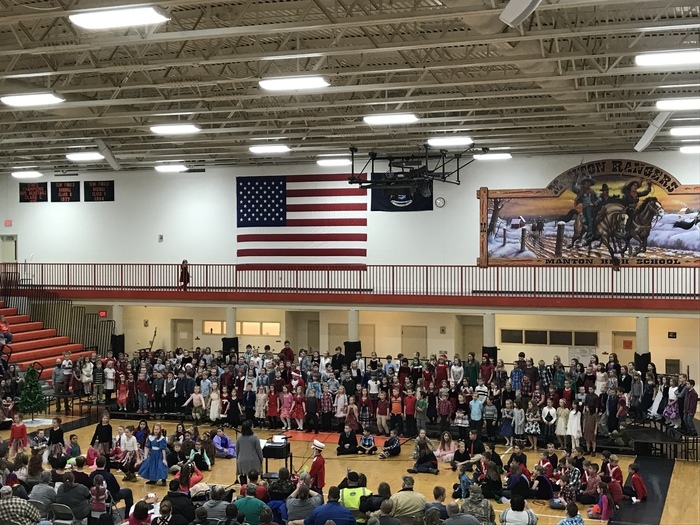 Elementary Christmas Concert! 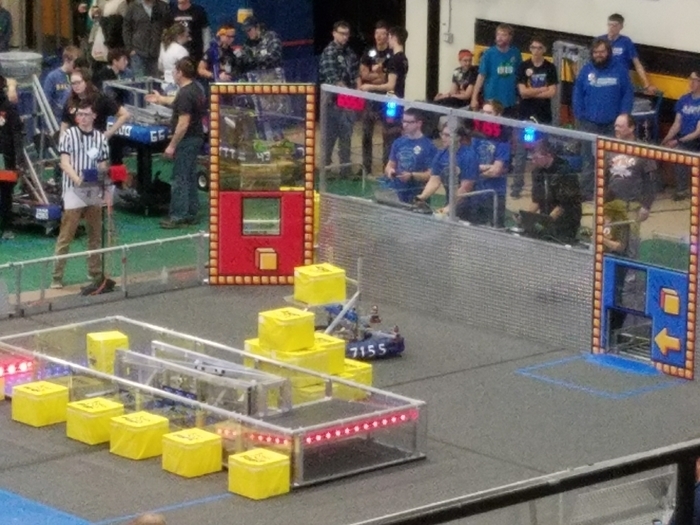 They're doing great!